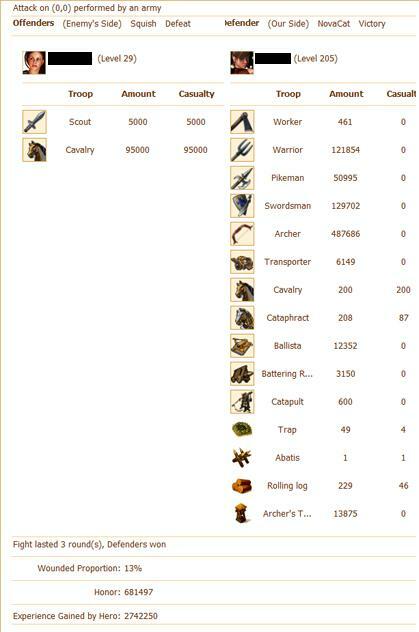 Cav waves of 90k+ can kill over 200K archers in one hit, or lots of ballistas.. (Cav Bomb, anyone??) But when people mix only Scouts in with their Cavalry, the outcome is pretty poor.. Pretty simple really… To Defend against the lots of Cavalry and few Scout with Minimal Losses just move out all troops except Archers with a few K Cavalry and Open Gates – If the Attackers send Scouts, or any other troop with the Cavalry, make sure you leave some other Layers as well. Just make sure when using this method that the Attacker does not too many other Attacking Troops with his Ponies besides Scouts.